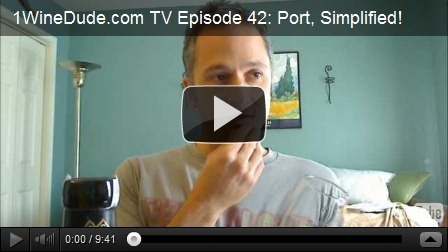 1WineDude TV Episode 42: Port, Simplified! In this episode of 1WineDude TV, I attempt to simplify one of the greatest of cool-weather beverages, Port – and I try to tell you most of what you will ever need to know about Port in under five minutes. 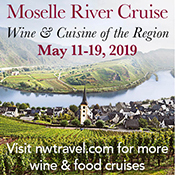 I fail, primarily because I go way over five minutes, but along the way I reveal a simple fact about Port that just might blow your mind, and taste a great (and relatively inexpensive!) introduction to the Ruby Port style. Enjoy! Apparently this long-standing Reserve Ruby Port (Cockburn’s invented the Reserve category in the late 1960s) from this long-standing producer (they’ve been in the Port biz for about 200 years) was revamped recently when Symington Family Estates gobbled up Cockburn’s last year – the grapes are primarily from the Quinta do Canais vineyard in the upper Douro, and the style has been tweaked along with the packaging. The result is a higher-quality Reserve Port that’s quite true to its Ruby colors: semi-dried fruits like fig and date can be found, along with dark cherries, plums and the “signature” peppery spice that marks a good Ruby. Chocolate notes send the whole thing down the hatch in a fairly well-balanced, elegant, and downright genteel package. A solid buy for cooler evening, post-dinner, fireside-chat action. Nice job Joe…succinct even with the 5 minute bait and switch. Looking forward to the Tawnies and will try to resupply between now and then. I have been so occupied with buttoning up the barn, the cellar has been neglected. Thanks, Todd. I know the feeling – with my own personal wine buys, it is usually feast or famine. But then, the famine gives me time to try to catch up on the samples, which is a losing battle… :) Cheers! nice video! a great "dashboard version" for newbies. Clay – ha!!! Thanks! Funnily enough, I realized that error after the vid had posted but by then it was of course way too late. Not the first time I've botched a pronunciation and certainly won't be the last. :). Cheers!